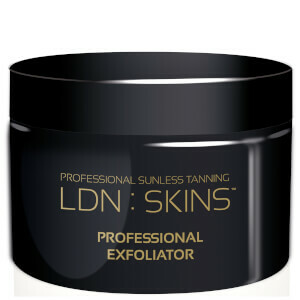 Polish and perfect skin with the LDN : SKINS Professional Exfoliator; a gentle yet effective scrub that leaves the body feeling smooth and refreshed from head to toe. The rich formula is infused with crushed Walnut Shell, which sloughs away dead skin cells and reduces the appearance of imperfections, whilst Papaya Enzymes visibly brighten and balance skin tone. Enriched with Orange Flower Oil, Yarrow and Grapefruit Peel, the exfoliator is also able to stimulate circulation, detoxify skin and perform a deep cleanse. This visibly rejuvenates the body, encouraging a more youthful appearance that is calm and conditioned. Finished with a dose of English Lavender, the treatment promotes healthy and flawless-looking skin. Massage a generous amount onto wet skin over the body using circular movements. Ensure you pay particular attention to upper arms, hips, thighs and feet. Rinse off thoroughly. Use as and when necessary.